Design work started on the B-45 during WW2. The XB-45 made its first flight on the 24th February 1947. The B-45A started to enter service in August 1948. However, due to budget constrictions, the full order was cut to 142 from the inital 190. In mid 1951, with commitments in Koera, NATO realised how vunerable it was to attack from the Soviet Union in Europe. Therefore Operation Backbreaker was started. This was to convert existing B-45A models for the nuclear strike role. This nuclear deterant was then based as part of the 47th Bomb Wing at RAF Sculthorpe, until 1958. The RB-45C varient, also serverd with the RAF (35 and 115 Squadrons), as part of Opertation Jiu Jitsu. As the USAF was forbiden by the US President from overflying the Soviey Union, the British Govermant had no such problems. Therfore, 4 RB-45C aircraft were opertated to fly reconnasence missions over the Soviet Union. This lasted till 1954, and the RB-45C was withdrawn from Soviet Union overflys, when one was nearly shotdow. 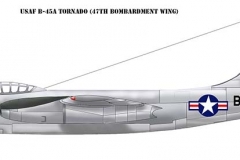 It was the first American 4 engined jet bomber, the first reconnaissance plane to do air to air refuling, the first jet bomber to carry a nuclear bomb and the first production American jet bomber.